Blackout returned to the Queen Elizabeth Olympic Park for the first time since the Olympic Closing Ceremony, providing track, drapes and a kabuki system for Hard Rock Calling festival’s headlining act Kasabian in late June. 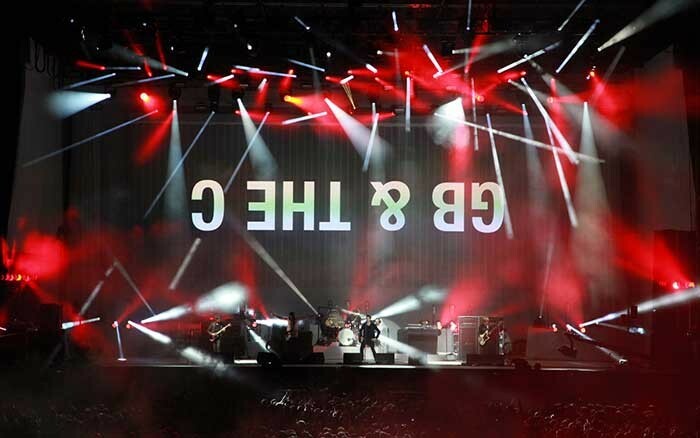 Kasabian’s lighting designer Nick Gray from Renegade Lighting, and production manager Steve Spencer approached Blackout to help bring their ‘white out’ concept to life and create a series of ‘reveals’ to make the most of the space on stage. Led by Blackout’s project manager Tim Searle, the team installed thick white molton drapes – custom made by the in-house sewing team – spanning the entire width and height of the back of the stage. Two side panels were added to create a white box and hung using tab track, allowing them to be pulled back until the band came on stage. In front of the main back drop hung the band’s large LED screen, which became a focal point for their performance. This was in place during the supporting act’s performances but concealed behind a further layer of white drapes, hung on curved tab track which opened from the centre at the start of Kasabian’s set. 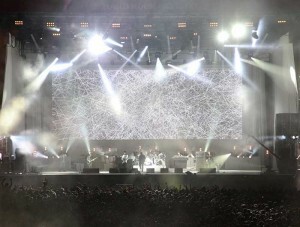 A solenoid kabuki system offered the final layer; installed just behind the band and in front of the curved drapes it was hoisted up at the start of the show and used to hang a banner imprinted with Kasabian’s graphics; dropping during their performance. Tim Searle comments: “It was all about creating depth; the drapes, screen and banner offering different levels and effects. We were able to pre-prepare most of the elements beforehand, keeping them concealed until Kasabian came on stage and revealing them by pulling back drapes, which were hung on tab tracks for this reason. It worked really well, making good use of the available space.